Along the banks of the mighty Spokane River, multiple bands of the Spokane Tribe lived off of the abundant fishing ground and called it Spokan Falls. The name "Spokane" is actually derived from the Salish term meaning "Children of the Sun." 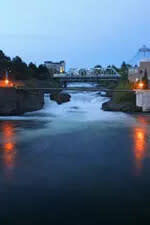 Trappers and traders began to settle in the area in 1810, and Spokane was officially incorporated as a city in 1881. Now, more than two centuries later, Spokane offers the perfect blend of unique attractions, proximity to the outdoors, fine arts, hip nightlife, world-class dining, shopping and big-name entertainment. Spokane is the second largest city in Washington state and the largest city between Seattle and Minneapolis. In 1974, Spokane was the first city to host an environmentally themed world&apos;s fair. That put Spokane on the map, and it is still the smallest city to ever host a world&apos;s fair. Continuing to make a name for itself, Spokane is home to the world&apos;s largest 3-on-3 basketball tournament, Hoopfest, and one of the largest running events in the world, Bloomsday. Spokane boasts a steady economy and has expanded to nearly a quarter million residents within the city limits and over half a million residents county wide. Rich in architectural history and distinctive neighborhoods, Spokane has been featured on several affordable living lists. Spokane and nearby Coeur d&apos; Alene were recently merged into a single metropolitan area by the U.S. Census, making it the 87th most populous metropolitan area in the United States. Spokane offers a fantastic business climate with inexpensive properties, great public resources, a talented work force and consistent opportunities for growth and expansion. As the center of a three state, two province region, Spokane is the destination for shopping, dining and entertainment. World-class restaurants scatter downtown and the surrounding areas. More than 20 wineries call Spokane home, and many have been recognized with national awards for their wine. Multiple live theatres, the Best of Broadway series, national level concerts and numerous local artists make entertainment easy to access any day of the week. Spokane is an outdoor enthusiast&apos;s dream. The Spokane River runs through the heart of downtown, yet feels miles away during an early morning paddle. Five mountain ski resorts are within a two-hour drive of Spokane, giving you more time on the slopes and less in the car. Visit one of the area&apos;s 76 lakes or tee off at one of the 30+ regional golf courses without breaking the bank. Bike, walk, or run through the Spokane region on the Centennial Trail, a paved path which stretches 37-miles from the Idaho state line to Nine Mile Falls. With white-water rafting, hiking and rock-climbing at your fingertips, see for yourself why Spokane is Near Nature. Near Perfect.